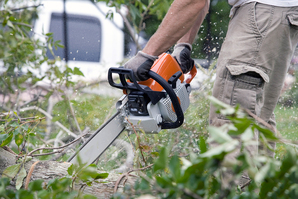 Land clearing, bush clearing, and landscape clearing is one of our specialties at Volusia Tree Service. Most people don't have a bush hog lying around in the garage, and that's where we come in! We are experts at clearing land for both homes and businesses. Sometimes you get to a point where you just have to clean up the yard or back 40, and get things looking orderly again. That's when the good folks of Volusia County call us! Many times we get calls from neighbors complaining about rodents entering their property from overgrowth areas next door that are a haven for nasty little critters. So why not clear it out and make it safe again, and get the neighbors off your back. Once you get it cleared out, you will be so happy that you did. 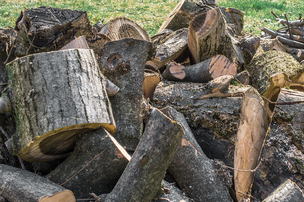 And if you have hazard trees or stumps that need to be removed as well, we can take care of that for you too. We have the equipment and the know how to come in and clear your property of that gnarly, tangled overgrowth that has been an eye sore for years. So if you have a patch of weeds, overgrowth, and snake and rat-infested bushes, let us come in and clear this area out and make it look great again. Not only will it be more aesthetically pleasing for your property and thereby increasing your home value, but will also be safer for your family and neighbors. Land clearing and bush clearing can be dangerous, so let the professionals at Volusia Tree Service come in and take care of everything for you. The hazards involved in this work have to be seriously considered, which is why you need to hire a qualified company that is fully insured and all of its employees are fully insured. This will make sure that you do not have any financial liability in the project, as this can be very serious. There are many companies out there who will come to your home or business and perform this type of landscape work, who are not properly insured, which is always risky. So make sure you hire the professionals! We make our land clearing service an affordable option for homeowners and business owners. Our focus has always been customer service and making sure that we operate with fairness and integrity for all of our customers' tree needs. We can come to your home or business and not only provide a free estimate for land clearing and any other work that needs to be done, but we can also provide you with an analysis of your overall tree health. We can make them look better and more healthy. So call us today at 386-597-1285 for a free estimate. Our focus will be on your satisfaction, as we always aim to build long-term relationships.